Belize City December 20th, 2016 – The Florida Caribbean Cruise Association (FCCA) in collaboration with the Belize Tourism Board proudly hosted its 2nd and 13th annual Holiday Gift Exchange Projects in Harvest Caye and the Fort Street Tourism Village respectively. Every year with the assistance of the Ministry of Education, ten (10) different schools are selected from different regions so their students can participate in this noteworthy event. This year, the Cruise Industry catered to four hundred (400) students selected from the schools. The South of Belize was the first to experience the Christmas feeling on December 14th as this was the first destination for the FCCA to spread the Christmas cheer. With Harvest Caye hosting, a total of 200 children at this event experienced the true joy of Christmas when they received Christmas gifts and snacks from Santa Claus and his twenty-five helpers that arrived via the Norwegian Getaway cruise ship. Entertainment was provided by a DJ, Ozzie the clown who made balloon animals for each child and a face painter who painted every child’s face. These children also received their own personal tour around the Caye to experience the beautiful paradise known as Harvest Caye. The Old Capital was next to experience the Christmas cheer. 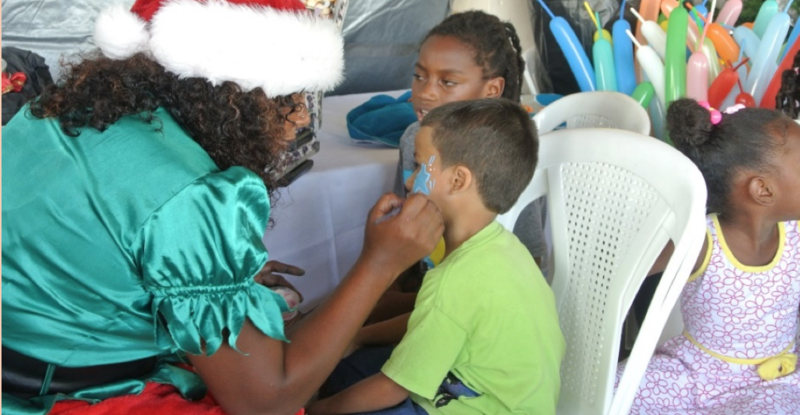 This year’s Annual Holiday Gift Project in the city marked the 13th year it has been executed in Belize City and just like the previous years, the children were more than excited to be a part of this joyous and noteworthy event. The gift presentation took place at the Fort Street Tourism Village in Belize City with Santa Claus and his helpers arriving once again via Norwegian Pearl cruise ship with the Christmas gifts, snacks and entertainment. Just like the first, the Cruise Industry catered for a total of 200 children in Belize City with a DJ, Ozzie the clown and a face painter present. Closing off the event these children received their own personal tour and train ride around the city, experiencing the beauty our country has to offer via Calypso Train Tours. On a yearly basis, the Belize Tourism Board coordinates with FCCA to make this noteworthy event a grand success. Both events proved worthwhile and the Belize Tourism Board, in coordination with the Florida Caribbean Cruise Association and the Norwegian Cruise Line Ltd, strives to continue this tradition. These events would not have been possible without the assistance of all sponsors. The BTB and the FCCA takes this opportunity to recognise Fort Street Tourism Village Management, Premier Charters & Tours and the Calypso Train for their valuable input in this venture.